We've rehearsed our Oscars speech more times than we can count. So, suffice to say, we understand the instinct to have a well-thought-out monologue in your back pocket for when that time comes. (And, our time will come — oh yes — our time will come.) Still, there's something so cringe-worthy about an overly prepared speech, wrought with dramatic pauses, heavy stares, and several mentions of shock, awe, and The Academy. We all know the ones. But, we don't all know the nitty-gritty details that make them so off-putting, or, in the best-case scenario, so successful. For that, we turned to Susan Constantine, body language expert and acting coach, to focus in on just what's going on behind the scenes right before our very eyes. First, we'll look at two of last year's most memorable speeches from Anne Hathaway and Jennifer Lawrence, and then we'll dig into more general tips on how to detect gratitude from great acting. In the case of Anne Hathaway, Constatine is a bit split. She says that Hathaway is "well rehearsed," noting that she lists people in terms of their "level of importance." She’s "breathless at first from the adrenaline." However, she's definitely in control of the situation. Anne is, above all else, "well rehearsed." And, she uses the pulsing of the statue to emphasize those she's thanking. “Sometimes [Anne's] face is a masked face. A masked face is one that you want the world to see because you feel that’s what people want to see and hear, and that’s why you project that," Constantine explains. Still, Anne's base emotion is absolute gratitude. Constantine argues Hathaway's smile is genuine. This can be noted in the raising of the cheekbones and increased wrinkles around the eyes. Constantine also explains that Anne's aside, "dreams do come true," is a deviation from her otherwise buttoned-up, well-rehearsed speech. It's an off-the-cuff moment that can be noted by her "girl like" voice. "Her voice lowers and becomes more secret-like, which indicates there's a lack of confidence on the part of the speaker." 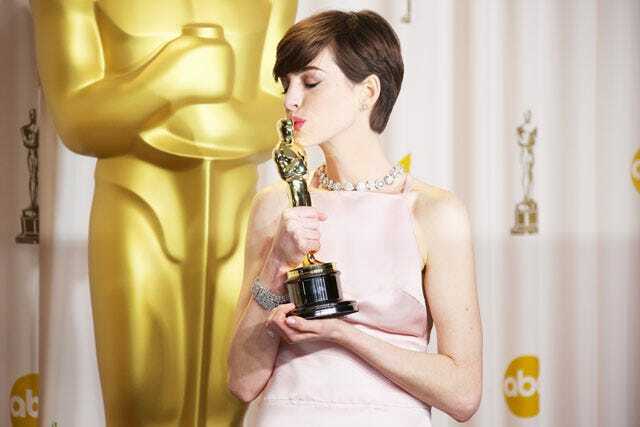 And, while we've never noticed a lack of confidence in Hathaway, it's easy to see how blissful she was about her win. Jennifer Lawrence's speech was almost the opposite of Anne Hathaway's. Constantine thinks she's "very authentic, believable, and likable. There's a sense of empathy." Most important, though, Lawrence's hand gestures mirror what she's saying. "She’s thankful, she’s like, 'Thank you so much,' then the hands [going to the heart or stomach] match the words. When it’s not true, the hand gestures and their verbal content are in discord." And, the famous fall? Well, that only added to the charm of the speech. "I love the fact that instead of pretending it didn’t happen, she brought attention to it, which really is a great skill for a professional speaker,” Constantine explains. “Because everybody saw it. I think it created more of that likability factor, because she basically said, 'Look how I just screwed up' and she brought attention to it. I think that was very authentic." But, what about all the speeches coming up? What should we look for on Sunday night? We asked Constantine how to decipher the speeches this weekend. And, there are a few tips you should know in order to play along. Crying, for example, should always be watched carefully. "What we’re looking for — in the sense of your crying when you’re winning an award — is this cognitive low build, which is of happiness and…humility at the same time,” Constantine says. “An awkward thing will happen, sometimes they’ll cry and they can laugh at the same time. That’s because they’re flooded with emotions. It’s a very sobering effect, when you’re in front of other people, and you’ve won this award, you’re very humble and thankful. At the same time, the overwhelming joy will actually cause a cognitive response of crying when it's truly felt. You will see that in sadness when someone is crying, that their eyelids become more droopy, and their face — particularly their cheek area — will look almost like it’s melting off of their skeleton. That’s when it is real. You may even see the corners of the mouth turn down slightly." Noted. And, the most grateful hand gestures? "Always palms up, hands to chest, hands to stomach." Constantine says. Finally, split hairs on the specifics. "You have to listen carefully to how people phrase words and the type of words they use. Generally speaking, if they’re using first person, singular pronouns like 'I, me, my,' they tend to be very truthful. If someone reflects, and they say 'them, those' or 'people have said that…' that’s disassociating, that’s not heartfelt." So, when we give our speech? Well, just look for the authentic tears, the authentic smiles, the hands to the heart, and, of course, a mention of the good ole' Academy.